The Huion GT190 looks a lot like the Wacom Cintiq, which makes it a fantastic alternative. It also has a 19′ screen, which isn’t offered by Wacom, who only offer a 13′ and 22′ size with no other sizes in between. It is also very light for its size. Wacom’s Cintiq 13′ weighs in at around eight lbs, while Turcom’s TS 7190 weighs a little under 10 lbs. Buyers be warned: the Turcom TS 7190 is essentially a copy of the Huion GT190. This is not the first time either, as Turcom has been known to steal designs from Huion blatantly. In several of their product ads and store listings, their employees at times even mistype the item name and name it the same as Huion does. That’s some really lazy copy and paste! The GT190 has every one of the standard features associated with an average draw-on-the-screen type tablet: video hookups, DVI, tilt adjustability, position lock button/lever, adjustable leg/stand, USB, and VGA. The style is professional and pleasant, with a two-tone black and silver colour typical of electronics. It has a significant vent area on the back top side for cooling, and the stand is almost as wide as the display screen for increased stability. It comes in a regular cardboard carrying box, equipped with a handle. Not as impressive as several of their mid-range tablet boxes, which have a minimalist, all white, Apple vibe graphics that are sharp. Basically the box for this item looks as a cardboard carton you would get your flatscreen TV in. Does it really matter? Not really. The Huion GT190 works with Windows 7, Windows 8.1, Windows 8, Windows 10, as well as Mac OS 10.8 and Mac OS 10.10. or perhaps higher. It works with many software such as CorelDraw, Stratos3D Max, Manga Studio, Macromedia Flash, Adobe Fireworks, Adobe Illustrator, Photoshop, Corel Painter, AutoDesk Maya and ZBrush. Nevertheless, you need to do due diligence as Huion hasn’t tested out all these software properly. The tablet of yours may use several versions of the software program and not others. As of today, there’s no complete list with what versions are incompatible or compatible with specific program version. Nevertheless, Huion has excellent customer service and you are always able to drop them a line with suggestions, and questions. Okay, time to determine if this machine really does match up to a Wacom Cintiq. I tested out this by breaking out my VGA cable and connecting it to my screen. Note: you want a computer with multi-screen capability to run this tablet. In this case, I ended up with three monitors. The very first thing I noticed was the absence of hotkey buttons. The Cintiq comes with four hotkeys and one scroll wheel. The GT190 does not, so you are likely to have to remember those keyboard combos for this one. Drawing on the screen was a pretty standard experience, so that is obviously a big positive! I did not really notice any glaring errors or extreme differences in quality. 16.7 million colours are claimed by the manufacturer. The human eye can see approximately ten million colours, so I am not sure how you can tell the difference between additional 6.7 million, but I can say that the colour quality was terrific from the right angles. From various other angles, the colours begin to be much more saturated than usual, which will throw off the accuracy of your work. If you do not mind adjusting the tablet of every time you need to draw, it is not actually a huge deal. Other concerns are with changing the brightness setting, which may only darken the colours rather than dimming the backlight like it is supposed to. The one thing that detracted from the colours was the shiny surface of the tablet. The bundle includes a glove that spreads over the bottom section of your hand so you do not leave marks on the screen, but despite that, I discovered it was not hard to dirty the drawing surface area with my hand. I am kind of biased though, I really choose a tablet without a display screen for this reason, so take this point with a grain of salt. The tablet adjusts horizontally and vertically. Horizontally the viewing angle is really effective at 170 degrees compared to Cintiq’s 178 degrees. I doubt you will also notice the difference. Nevertheless, in case you are not sitting head on to it vertically (eyes perpendicular to the screen surface), you most certainly will notice some distortion. If you lean in really close up, you can see a little bit of distortion between where stylus touches the screen and where it thinks you are drawing too. Depending on your setup, this might be one thing you may want to think about. The cables come out from the bottom of this particular unit, which kind of blocks it from tilting all the best way to it’s maxed angle. You will find some other tablets that do not do this, the Cintiq and Yiynova MSP19U are two examples that have cables coming out from the side rather than the bottom. Quality control appears to be decent, I have an excellent, functional unit and was drawing right out of the box with it. During the research that I did, I came across some folks complaining about dust trapped under their screen as soon as they removed it from the box. In case you obtain one of these, and you are not in a hurry, return it for a replacement. As is standard practice for many tablet manufacturers, the pen came with a pen holder. The pen holder opens up and doubles as a nib keeper with eight slots for spare nibs. The stylus is rechargeable and also comes with it is own power cord. For comparison, the Cintiq’s pen is available in a fancy box rather than the circular pen holder. The Cintiq pen kit includes a number of different replacement nibs, while the Huion kit only contains one kind of spare nib. The Cintiq kit also consists of a colour ring to mark the pen so you know which is which (either for telling the big difference between what nibs are installed, or perhaps for personal preference). 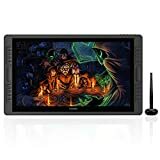 This is a fantastic tablet for those that would like to step up their graphical drawing game seriously. I will be truthful; it is not a “professional’s” tablet. Most professionals shell out big money to get the Cintiq, but this is a fantastic replacement for the hobbyist drawer who’s experience level is above average. This tablet has about 90% of the Cintiq’s functions at about a quarter of the cost. When you do not mind putting up with it is few minor flaws, it is a great tablet which will serve you well.